Game & Watch Collection is a limited edition Nintendo DS game that used to be only available via the Club Nintendo service in Japan in 2006. It was extremely rare outside of Japan back then. Later, Nintendo brought Club Nintendo to America, Europe and Australia as of December 15, 2008, and Game & Watch Collection was made available via the service in those regions. Game & Watch Collection is a collection of three classic Game & Watch compilations from the Game & Watch series. 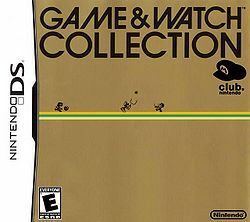 A sequel to this game, Game & Watch Collection 2 was originally released on December 15, 2008 in Japan, as part of the Club Nintendo program. It was made available to North America on March 31, and Australia in September later that year. It features the games Parachute and Octopus, as well as a new game: Parachute × Octopus, a combination of the two. This page was last edited on April 7, 2019, at 11:22.